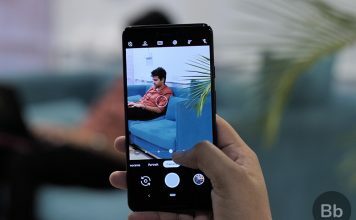 The best way to get the ‘Motion Photos’ effect on your Android device would be via a popular third-party camera app called Camera MX. So first things first, head over to Google Play Store and download the app on your phone and open the camera interface. Now, tap on the second icon from top left, the one with three large dots as seen in the first image below. 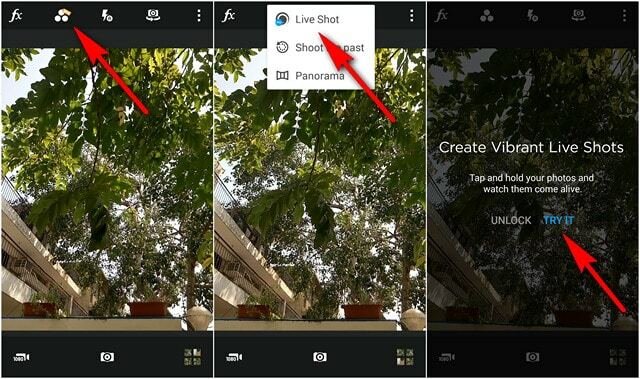 Select the ‘Live Shot’ option and tap on ‘Try it’. 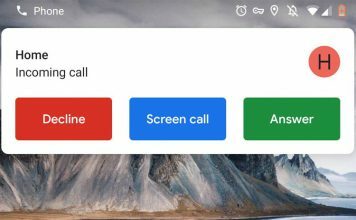 You’ll get three live shots as trial before you’ll need to log in with your Facebook or Google account to keep using the feature any further. Once you activate the Live Shots feature, all your photos will have a bit of video attached to them. To check out the implementation, you can view the images in the app’s built-in image viewer. 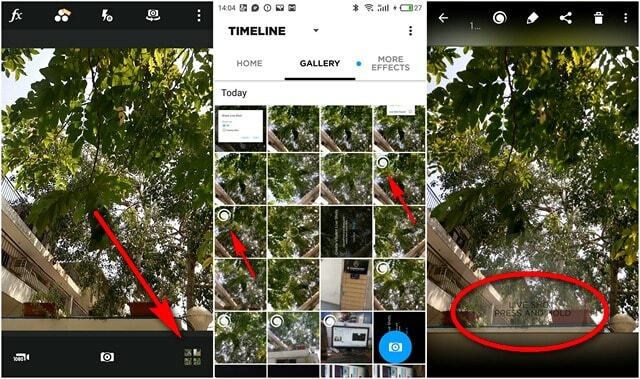 To do that, tap on the ‘Gallery icon’ in the bottom-right corner of the app’s camera interface, and then choose a live shot that will be marked with a hurricane-like icon as shown in the screenshot at the center. Once you’re viewing a live shot, you’ll be prompted to “press and hold” to see the video playing in a loop. 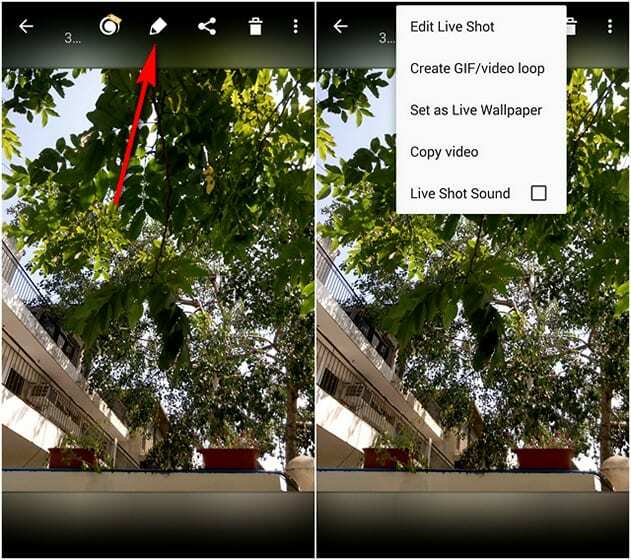 You can edit the live shot, create a GIF or a video loop, or even set the image as live wallpaper by tapping on the ‘pencil icon’ on the top bar and choosing any of the options, as seen in the screenshots below. 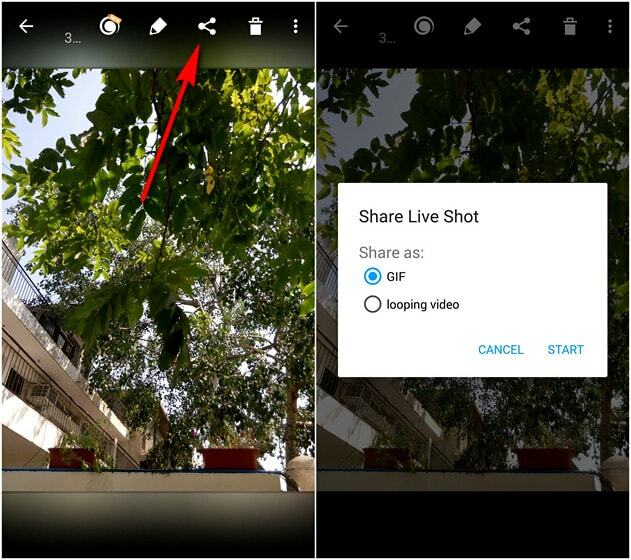 You can also share a live shot as a looping video or an animated GIF by tapping on the ‘share icon’ as seen below. 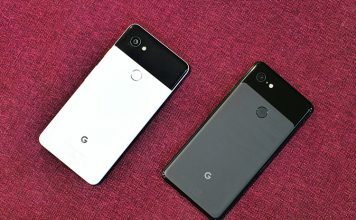 Note: You can also use Google’s own Motion Stills app to create GIFs but unlike the Motion Photos feature in the second-generation Pixel twins, Motion Stills is all motion and no stills, meaning, you won’t actually get a still photograph with the app. Meanwhile, if you already own any of the Samsung flagships launched this year (Galaxy S8, S8 Plus, Note 8), the Motion Photos feature comes with the default Samsung camera app, so you won’t even need a third-party app to get that on your phone. 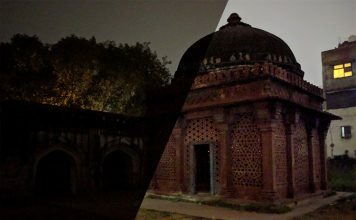 Motion Photos is certainly one of the cool features that Google has introduced with the Pixel 2 and the Pixel 2 XL, but unfortunately there’s no word on when it might be rolled out to other Android devices. However, now that you know how to get the same feature on your Android phone, go ahead and give it a shot, and don’t forget to let us know how it worked by leaving your thoughts in the comment section below, because we love hearing from you.